No! Just kidding. Maybe it was in my dream. Funny thing, I started out thinking of all the things I CANNOT have – pizza, pasta, bread, DIET COKE – but now its thinking about all the good things I CAN have. Fresh fruit. Fresh veggies. Shrimp. Beef. Nuts. Baked Potato. I. Will. Survive! Last night we had fresh fish browned in a little ghee and coconut oil Okra. And while The Man had leftover ‘non-compliant’ mashed potato cakes browned in ghee I had.. It was easy to make. Process cauliflower in the food processor. Brown some onions, garlic, and carrot in ghee. Add in the ‘rice’ and let it steam until soft. Easy! I think I liked it but I’m not really sure. I think using a little Sesame Oil would really up the flavor. The recipe is on page 272 of The Whole30: The 30-Day Guide to Total Health and Food Freedom. I also found the recipe on Recipe Girl’s Website if you want to try it. I will try it again. As much as I love cauliflower I’m not sure if this will be a hit or not. I don’t know about you but Shepherd’s Pie is a common occurrence in our kitchen. Whenever I need something easy and filling I usually turn to Shepherd’s pie. And there is not much difference between one recipe and another. Except years ago I stopped using any kind of canned soup and started making my own filling. SOOOOO much better. But I was still unhappy because of all the potato topping the pie. I don’t have to worry about that any more because of Ellie. This topping is made with potatoes and cauliflower. A new twist on your every day Shepherd’s Pie. And a good one. Even The Man liked it and he is NOT a cauliflower fan. 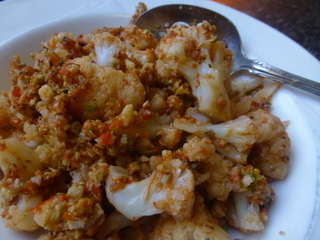 The steamed cauliflower mixes in very well with the potatoes so that the taste is more potato. And although Ellie doesn’t add the cheese on top it just wouldn’t be Shepherd’s Pie with out a little cheese. The filling is lean ground beef mixed with onions, carrots, mushrooms (which I left out), peas, and seasonings. Very tasty. The recipe is from Ellie’s Comfort Food Fix (page 131) but it is also HERE! More Beef recipes are on Eating with Ellie. While you are there check out the schedule of Themes for Eating with Ellie. Won’t you join us? Hard to believe it is already March 18th. I am constantly astounded at how quickly time goes by. Seems like just yesterday I received my ‘assignment’ for The Secret Recipe Club and now it already time to post about it. This month I cooked with Sarah. She is the cook/baker and mother of three adorable kitties who blogs over at The Pajama Chef. Lucky for her husband she loves to try out new dishes and he becomes her sous chef. As usual I found more recipes than I had time to make. For some reason I gravitated toward sides and sweets this month so that is what I went with. Cauliflower is one of my favorite veggies. As a child I only ate three – cauliflower, broccoli, and corn. And the only way I would eat the cauliflower was with cheese. Times haven’t changed much except this time the recipe is different. Shredded cauliflower baked with herbs and cheese. Good Stuff!! I made mine in mini cupcake tins and they were perfect bites. And then two sweets. The Man has been asking for something to eat with lunch. Just a little bite of something sweet. How about Peanut Butter Sandwich Cookies and not just any filling but dulce de leche – Caramel! Yep, made from Sweetened Condensed milk. Cooked until it is thick and super sweet. Fortunately I keep several cans in the pantry already to use. While she empties the can into a double boiler and cooks it until it is very thick I have always just cooked 3 – 4 cans in boiling water so I always have some. These are very sweet and one or two are all you need to satisfy that sweet tooth. I don’t think I will make just plain cookies again. One night I needed something just for the two of us. Something that would be gone in one night. Sarah’s Twice Baked Apple Crisps were just the thing. They were good, but the crisp just would not cooperate for me. So we had Baked Apples in Sauce. :(. I don’t know what happened here. But it was still good, especially with a little whipped cream. Sarah suggested ice cream and that would have been so much better. and lots more….. I’ll be going back to visit Sarah because I know I will want to make more of her dishes. Too good to pass up. Please visit the rest of Group C and see what they cooked up this month. If you want to join in the fun visit The Secret Recipe Club to find out how. This weeks pick was from Kayte. And it was an interesting dish. Cauliflower, broccoli, and corn were about the only veggies I ate as a child and they are still my favorites. Finding new ways to cook them is always fun. Usually. I have to admit this was NOT one of my faves. I should have liked this. A tapenade made with almonds, roasted red peppers, garlic, green olives and parsley sounded so good. But for some reason I just didn’t care for it. I added a little salt, but to no avail. I made 1/4 of the recipe and still have some of the tapenade, which I liked, left and I know it will be good with some toasted bread. But not the cauliflower. Check with the others via Eating with Ellie and see if I was the only one. The recipe is on page 251 of Ellie’s Weeknight Wonders. When I was growing up I was not a vegetable eater. I guess most kids aren’t. My Dad wasn’t much of one either. But there were a few I really liked. Broccoli, strange for a kid. Corn, duh! Cauliflower. My salad usually consisted of lettuce and mayo, Ugh!! That was it. No peas. No greens. Since then my tastes have changed. But I still like my old standbys. And this dish with tons of cauliflower was right up my alley. What we have here is a layer of sliced cauliflower with dollops of caramelized onion covered with Fontina cheese sprinkled with fried sage and Parmesan. I mean really, can you think of a better way to eat cauliflower? This was Gaye’s pick for this week’s Wednesday with Donna Hay. I hope the others liked it as much as I did. 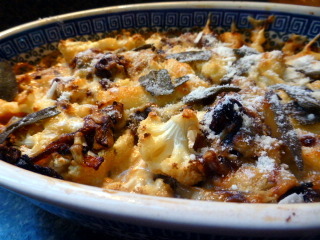 You can check out everyone’s cauliflower dish on our Blog. And if you would like to join us – we are using Donna’s website, magazine, and several of her books for the recipes. Just leave us a comment. Love to have you!